Urgency to embed awareness of sustainability principles and practice across society, and need for digital literacy and advocacy for sustainability are reshaping ESD. These, together with developments in learning and teaching, demand new tools to support implementation of project-based learning and more interactive approaches. This investigation explores the evolution of susthingsout.com, an online magazine for students, academics and expert practitioners, developed by the University of Worcester. This comprises two parts; the first, a private site specifically for students involved in sustainability learning on-campus; the second, an open-access site developed to deliver sustainability information and good practice across campus, community and not-for-profit and commercial organisations. This paper involves only the private site i.e. the equivalent of an in-house VLE specifically designed to support the teaching of sustainability to multi-disciplinary first and second year undergraduate students. It reports on the progress of the VLE, following three years of use and initial improvements, in terms of the student support and engagement, as well as considering the practical issues affecting these. The results fall into four categories of pedagogical, operational, cultural and external factors, which are synthesised to capture and share emerging knowledge of good practice offering insights to other developers of online sustainability materials. All authors are from the University of Worcester. Alessandrini, M. (2012). Non-positivist Approaches to Research in the Third Sector: Empowered Policy-making. Conference paper presented at the 10th International Conference Universita Degli Studi di Siena, Italy July 10–13, 2012. Available from https://www.istr.org/resource/resmgr/wp2012/m_alessandrini.pdf. Accessed March 08, 2016. Bertrand, J. T., Brown, J. E., & Ward, V. M. (1992). Techniques for analysing focus group data. Evaluation Review, 16, 198–209. Available from http://www.sagepub.com. Accessed October 27, 2015. Dengler, M. (2008). Classroom active learning complemented by an online discussion forum to teach sustainability. Journal of Geography in Higher Education, 32(3), 481–494. Available from http://www.tandfonline.com/doi/abs/10.1080/03098260701514108. Accessed December 16, 2015. Demian, P., & Morrice, J. (2012). The use of virtual learning environments and their impact on academic performance. Engineering Education, 7(1), 11–19. Available from http://dspace.lboro.ac.uk. Accessed January 19, 2016. Fabricatore, C. & López, X. (2012). Sustainability learning through gaming: An exploratory study. Electronic Journal of E-Learning, 10(2), 209. Available http://www.proquest.com. Accessed March 08, 2016. Fazey, D., & Fazey, J. (2001). The potential for autonomy in learning: Perceptions of competence, motivation and locus of control in first-year undergraduate students. Studies in Higher Education, 26(3), 245–261. Available from http://www.tandfonline.com. Accessed November 15, 2015. Higher Education Academy. (2014). Education for sustainable development: Guidance for UK higher education providers. Available from http://www.qaa.ac.uk/en/Publications/Documents/Education-sustainable-development-Guidance-June-14.pdf. Accessed December 05, 2015. HEFCE. (2013). Sustainable development in higher education: Consultation on a framework for HEFCE. Higher Education Funding Council for England. Available from http://www.hefce.ac.uk. Accessed December 12, 2015. Hockings, C., Cooke, S., Yamashita, H., McGinty, S., & Bowl, M. (2008). Switched off? A study of disengagement among computing students at two universities. Research Papers in Education, 23(2), 191–201. Available from http://www.tandfonline.com. Accessed November 12, 2015. Hutchings, M., Hadfield, M., Howarth, G., & Lewarne, S. (2007). Meeting the challenges of active learning in web-based case studies for sustainable development. Innovations in Education and Teaching International, 44(3), 331–343. Available from http://www.tandfonline.com. Accessed December 07, 2015. Isacsson, A., & Gretzel, U. (2011). Facebook as an edutainment medium to engage students in sustainability and tourism. Journal of Hospitality and Tourism Technology, 2(1), 81 – 90. Available from http://www.emeraldinsight.com/doi/abs/10.1108/17579881111112430. Accessed December 07, 2015. Johnson, L., Adams Becker, S., Estrada, V., & Freeman, A. (2014). NMC horizon report 2014 Higher education edition. Austin Texas: The New Media Consortium. Available from http://www.nmc.org. Accessed December 01, 2015. Kennedy, G., Judd, T., Churchward, A., Gray, K., & Krause, K. (2008). First year students’ experiences with technology: Are they really digital natives? Australian Journal of Educational Technology, 24(1), 108–122. Available from http://www.ajet.org.au. Accessed December 04, 2015. Kuss, D. J., & Griffiths, M. D. (2011). Online social networking and addiction—A review of the psychological literature. International Journal of Environmental Research and Public Health, 8(9), 3528–3552. Available from http://doi.org. Accessed December 04, 2015. Laird, T. F., & Kuh, G. D. (2005). Student experiences with information technology and their relationship to other aspects of student engagement. Research in Higher Education, 46(2), 211–233. Available from http://www.proquest.com. Accessed March 08, 2016. Li, R. Y. M., & Pak, D. H. A. (2010), Resistance and motivation to share sustainable development knowledge by Web 2.0. Journal of Information & Knowledge Management, 9(3), 251–262. Available from http://www.worldscientific.com/doi/abs/10.1142/S0219649210002656?journalCode=jikm. Accessed December 02, 2015. Lizzio, A. & Wilson, K. (2013). First-year students’ appraisal of assessment tasks: Implications for efficacy, engagement and performance. Assessment & Evaluation in Higher Education, 38(4), 389–406. Available from http://www.tandfonline.com. Accessed December 16, 2015. Lyndon, S., & Hale, B. (2014). Evaluation of how the blended use of a virtual learning environment (VLE) can impact on learning and teaching in a specific module. ELiSS, 6(1). Available from https://www.heacademy.ac.uk/sites/default/files/elss.6.1b.pdf. Accessed January 18, 2016. Morgan, D. L. & Spanish, M. T. (1984). Focus groups: A new tool for qualitative research, Qualitative Sociology, 7(3), 253–270. Available from https://www.researchgate.net. Accessed March 07, 2016. Prensky, M. (2001). Digital natives, digital immigrants. On the Horizon Report, 9(5). Available from http://pre2005.flexiblelearning.net.au. Accessed December 04, 2015. Raghubansie, A., Corbett, W., Boom, K., & Weaver, L. (2014). Digital learning for sustainability: An interactive magazine for students, academics and expert practitioners (pp. 3–17). World Sustainability Series. Available from http://link.springer.com/chapter/10.1007%2F978-3-319-10690-8_1#page-1. Accessed December 18, 2015. Sibbel, A. (2009). Pathways towards sustainability through higher education. 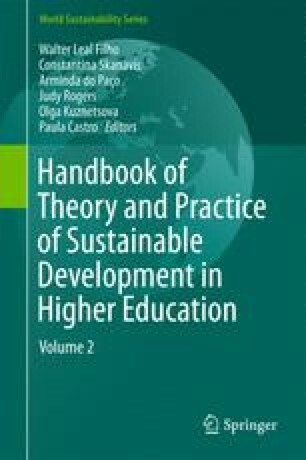 International Journal of Sustainability in Higher Education, 10(1), 68–82. Available from http://www.emeraldinsight.com/doi/full/10.1108/14676370910925262. Accessed December 02, 2015. Sterling, S. (2012). The future fit framework: An introductory guide to teaching and learning for sustainability in HE. York: The Higher Education Academy Available from https://www.heacademy.ac.uk/sites/default/files/future_fit_270412_1435.pdf. Accessed March 04, 2016. United Nations. (2015). Sustainable development goals, 17 goals to change our world. Available from http://www.un.org/sustainabledevelopment/sustainable-development-goals/. Accessed December 07, 2015. University of Worcester. (2013). Strategic Plan 2013–18. Available from http://www.worcester.ac.uk/documents/university-worcester-strat-plan-2013-18.pdf. Accessed December 01, 2015. Van Wynsberghe, R., & Andruske, C. L. (2007), Research in the service of co-learning: Sustainability and community engagement. Canadian Journal of Education, 1(1), 349–376. Available from http://www.csse-scee.ca/CJE/Articles/FullText/CJE30-1/CJE30-1-VanWynsbergeAndruske.pdf. Accessed December 02, 2015. Zepke, N., & Leach, L. (2010). Improving student engagement: Ten proposals for action. Active Learning in Higher Education, 11(3), 167–177. Available from http://www.sagepub.com. Accessed December 03, 2015. Zhao, C. & Kuh, G. D. (2004). Adding value: Learning communities and student engagement. Research in Higher Education, 45(2), 115–138. Available from http://link.springer.com/. Accessed on March 05, 2016.